The Nash Rambler is no stranger to the pages of the Daily Turismo; it exudes vintage style and can be purchased without taking out a second mortgage. The bathtub nickname was given because all four wheels had full covers and the body resembled an upside-down tub. 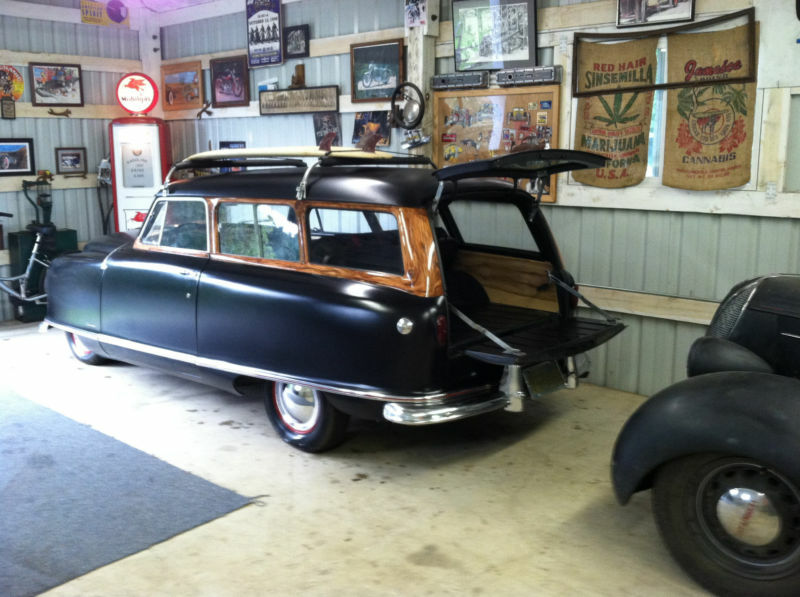 This 1952 Nash Rambler Greenbrier Wagon is bidding on ebay for $8,400 with 10 hours to go and located in a garage with some interesting wall 'art' in Roseburg, OR. 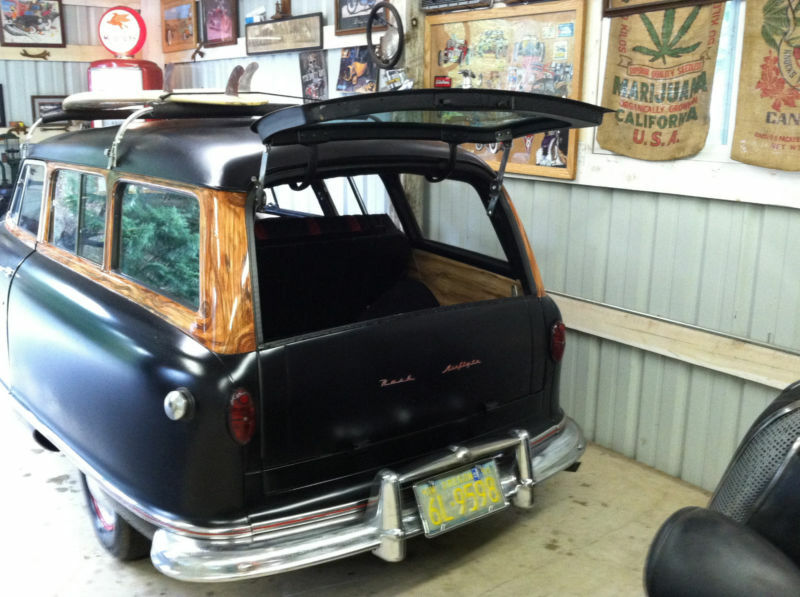 The Greenbrier option was only available for the wagon and added a two-tone paint/wood scheme, with real wood trim surrounding the rear and side windows. The wood is missing or painted on the rear hatch and this car looks to be painted flat black...or is very dirty. 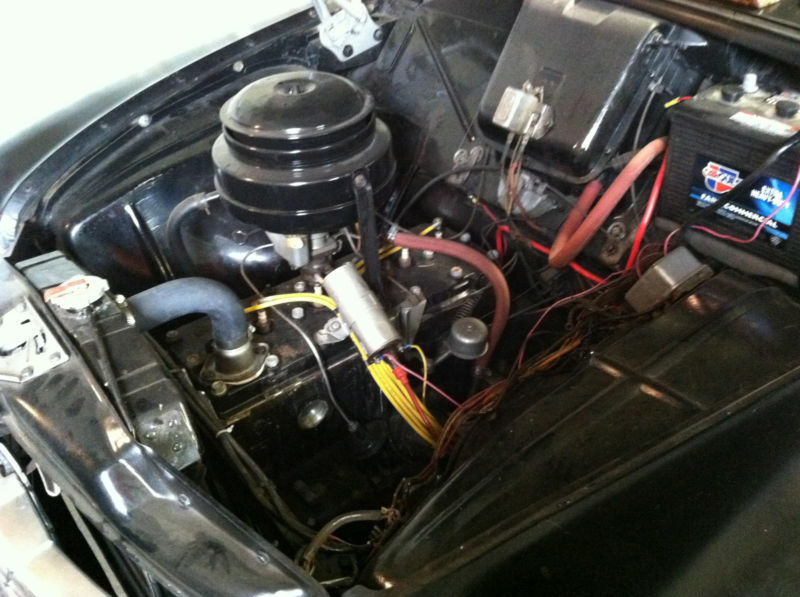 The Rambler is powered by a 2.8 liter L-head inline 6 that puts out 82 horsepower in stock form and is mated to a 3 speed manual transmission. The Rambler was a slow car when new, and takes 21 seconds to reach 60 mph from a stop. 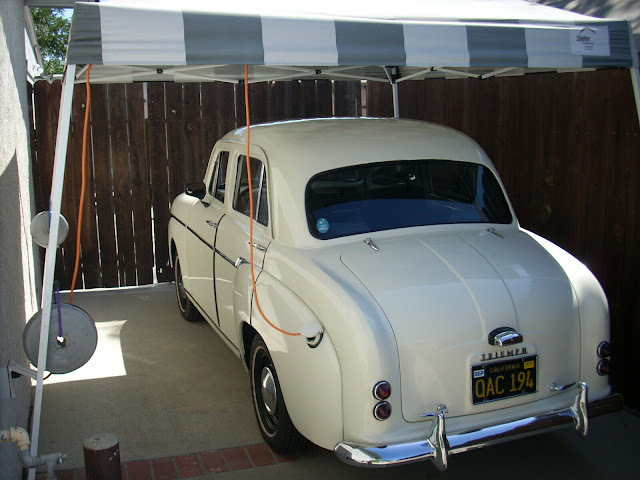 The slowness does result in remarkably good fuel economy for an early 1950s vintage car and it can get upwards of 25 miles per gallon. 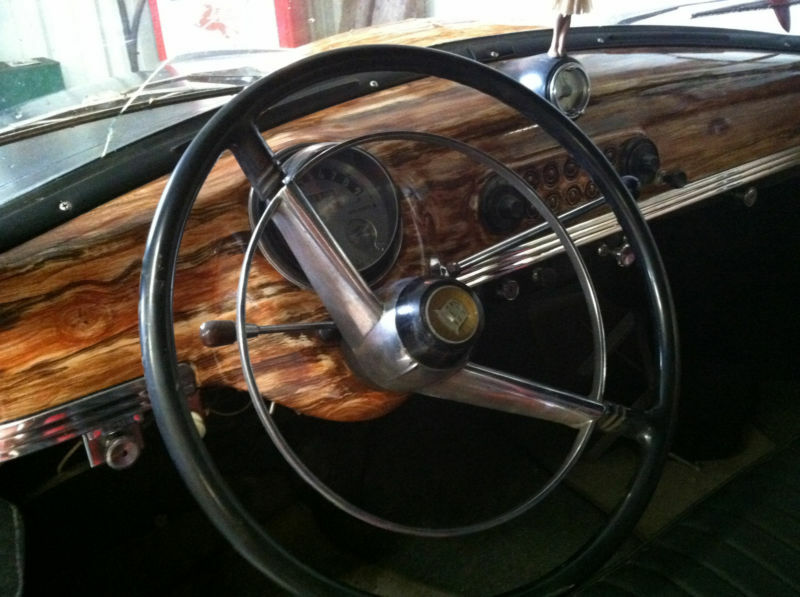 The vintage wood trim extends into the inside of this Greenbrier and looks really nautical, although this is probably woodgrained paint or water transfer on a steel dash. The seller claims the upholstery has been recently replaced and the one picture of the seats shows a red/black pattern, but details are limited. This car wears what looks like its original California black plate from 1952, which would be a huge plus since that means its never lived in the rust belt and Ramblers are prone to rust if not kept dry. Unfortunately this ad provides scant details as to the condition of this Rambler and is probably why the bidding is so low with a few hours left. It could be a great deal for someone looking for a surf-wagon, or it could be a horrible money pit covered in a cheap paint job and filled with hidden traps. Would you take the risk? To get out of second gear, depress the clutch pedal, move the gear shift lever straight down for third, release the clutch pedal. Cadillac drivers these days may be unlikely to know this, Do not beep at them asking for these instructions at 120. Cool machine but no wood on it at all......wood grain painting..........kinda weird that someone wuld try to sell it with "electrical charging problems". I mean what is there besides a short, a regulator, a generator and a battery? I bought the car and had it shipped to Pgh. The original high bidder backed out and I got it for way less. Those are not California plates, they are early 50's Oregon. Belive it or not the car was stored in a barn for the past 30 years. Mice were the reason for the new interior. SUPER SOLID, NO RUST. Guy who painted it was a true artist. I'm into the satin black and the car will soon be updated to 12 volt, red wheels, chrome caps and trim rings and wide whites. May have some tateful pinstripes added. I took the risk. Jackpot. Thanks. I'll keep you posted as it moves along.